A scrapbook album and journalling book I made for my friend and her baby baraka, Halima. Earlier this year my high school friend, sr. Nusrat (sr. meaning sister), had her first child and beautiful daughter. Alhamdulillahi rabbil `alameen. With most friends that come and go you cannot help yourself from basking in their 'happinesses' but for the rare companions in life, their joys become your joys, so I very much feel like my own sister has made me an aunt. See that? It's all me-me-me. The Front Cover: is backed with cardstock for strength and embellished with fabric flowers, paper butterflies, metal brads and a blank card tag, on which the baby's name and date of birth can be written. Printed card letters were used to title the scrapbook 'Halima' and patterned self-adhesive ribbon accentuates the whole layout. Each page is customised with space for journalling and/or a photo. Since each page has more decorations and isn't flat, the entire book is bound by ribbon to prevent tearing. There are around twenty pages in total, enough for the major events in a baby's first year of life as an earthling. On This Page: A circle print background paper has words stamped in the centre and a 3D rocking-horse sticker frames the page. The 'beautiful angel' tag consists of printed vellum and layered paper while I stapled ribbons on the edge to overlap the page. The page is secured with eyelets and bound by ribbon (those metal rims used to thread cord in jackets and shoelaces). 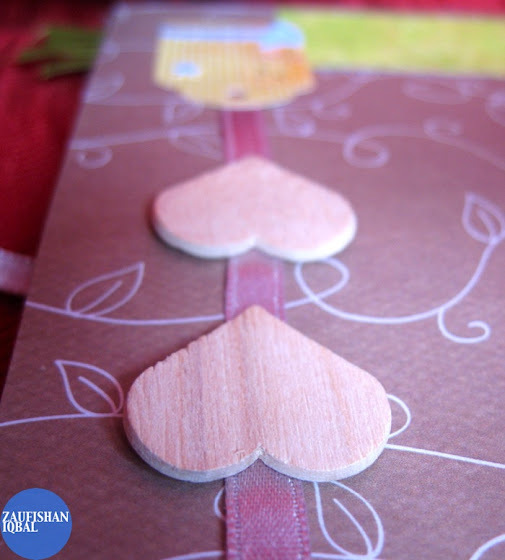 On This Page: Chipboard makes a versatile tag for presents and scrapbooking. I had a few heart shaped wooden tags that hung great off a ribbon bookmark. These tags can be written on or left blank. To create the feel of baby clothing a stitched ribbon was looped through a cardstock buckle. The purple text 'Perfect Angel' is a metallic transfer that is waterproof. On Another Page: I combined several elements: stamping the title 'Princess' onto ribbon, using puffy fabric feet, metallic stickers and a card buckle. The background sheet is inked with a darker shade of pink to create variety. On the final page I made and glued in an envelope with a special letter to baby Halima. When she grows old enough to read, she will have in her possession a personal message from her mother's friend and admirer. I would have included a few more photos of this but a little mystery is necessary! Nusrat's journal scrapbook for her daughter is acid-free and lignin-free which means photos and messages will last for several decades longer insha-Allah. The book is secured by wrapping ribbon around the front or back enclosure, a metal fastener. Finally, the book can be taken apart to add more pages or photos but I left it to Nusrat's beautiful family to use my gift, however they will. Alhamdulillah. If only more schoolmates would procreate sooner. Ma-sha-Allah.